2012, venus, zippers, zippers, lipstick, International Home Performance Festival, Oakland, CA. 2010, Gulliver, Final Fridays, Montalvo Art Center, Saratoga, CA. I recently finished my artist residency through Intersection for the Arts Artist in Residence at Salesforce Park in San Francisco this past September. The month featured experiments and performances centered on plants and climate change. 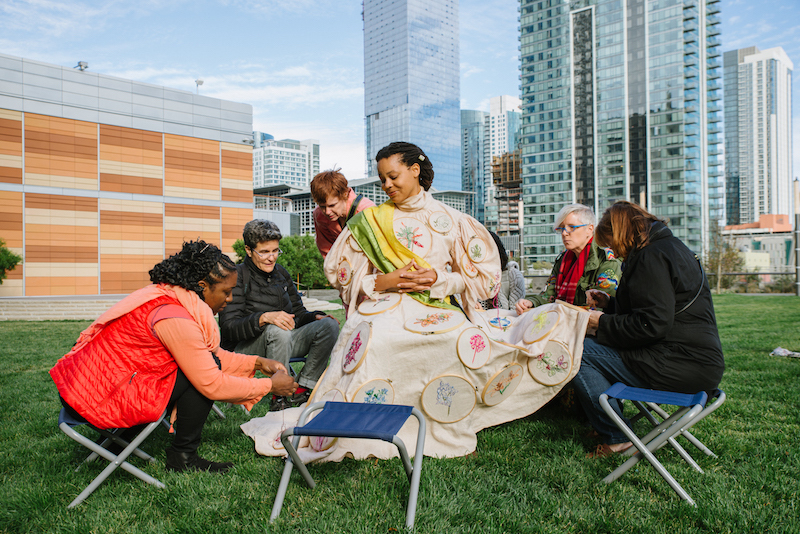 Salesforce Park Artist in Residence is an outdoor artist residency powered by Intersection for the Arts. A big thank you to choreographer/performer Cherie Hill and science journalist/conversationalist Lauren Muscatine for making this piece with me. We discussed climate change and healing plants with folks who joined the stitch circle, and Cherie Hill took us through the park in a movement sequence rooted in the story of historical figure Mary Seacole, a 19th-century Jamaican-Scottish plant-based healer, traveler, author, and hotelier. In this iteration, we worked from Mary Seacole's use of healing plants, and her ability to clear space for herself to walk through the world as a healer while defying convention as an "unprotected" woman of African descent in the 19th century. Now in its third year, "the lost ones" project brings people together with plants on the IUCN's "Red List" and asks them to contemplate their fragile status while helping to complete an embroidered garment that details over thirty such plants, all from formely colonized countries. Starting with the late 19th-century as an arbitrary marker for when our current mass extinction began to fully get under way, this iteration of the piece references Seacole as a historical figure from a former British colony who becomes a lens, reflecting and refracting ideas about humans' impact on the plant world and the ways plants respond. Lauren Muscatine, science journalist, has joined the performance twice now, engaging in conversation with me and guest stitchers about medicinal plants; how plants "clear space;" plant extinction, migration, and adaptation; and rewilding. Begun in October 2015, "the lost ones" combines dance, craft, and environmental science to build awareness of plant extinctions in a rapidly changing world where the rate of species' extinction has skyrocketed due to humans' impact on the environment. Sculptor Amy Brown and I conducted performative research throughout the park on Sept. 14. Mending Collective are Curators-in-Residence for the gallery's Peripheral Visions program for November - December. We are curating a show featuring three artists whose work incorporates a critical approach to sewing in the context of the global garment industry: Carole Frances Lung/Frau Fiber, Mansur Nurullah, and Angie Wilson. Liz Harvey, Leeza Doreian and Danielle Wright are Mending Collective. Mending Collective, founded in 2017, is a collective of artists who wish to create a space for people to come together to learn and practice visual mending techniques. We are concerned with economic models built on burgeoning consumption and waste specifically within the garment industry, but indicative of production in general. We explore the traditional practices of mending as a means to counter this narrative. We offer the shared sensory, economic, and social experiences of mending together. In mending, one becomes aware of the quality of the clothing one wears, skills development meets the bounty of benefits for the mender in the actions of mending, and frugality’s inherent sensuality becomes apparent. Liz Harvey was Artist in Residence through Intersection for the Arts at Salesforce Park in San Francisco in September 2018. She also served as Artist in Residence at the San Jose Museum of Quilts and Textiles from April - June, 2018. ​She was a 2017 Artist in Residence at ICB Studios in Sausalito, a 2016 de Young Museum Artist in Residence and was the 2015 Winter Artist in Residence at the Bay Area Discovery Museum in Sausalito.